It’s sale time at upscale department store Heal’s with discounts of up to 50 per cent available on homewear and accessories. Click through and you’ll find savings on all kinds of products from sofas and dining furniture to beds, storage and lighting. You can also have fun browsing through cut-price cookware, bedding, bathroom products and home accessories. The sale continues until May 2 but, as ever, once it’s gone, it’s gone. So get in early and see what bargains you can pick up. 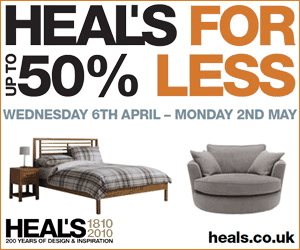 Categorised under Latest offers, Our partners, tagged under furniture, Heal's, seasonal offers.